Toby Knapp is no stranger to the Metal world. After being plucked by Shrapnel Records in 1992 at the age of nineteen, Knapp began a long and extensive work history as a guitar-slayer who is also known for his solo releases under the names: AFFLIKTOR and WAXEN. He has also released music with the band ONWARD as well as his collaboration with Dean Sternberg, WHERE EVIL FOLLOWS. Toby Knapp signed to Moribund Records in 2018, who also worked with Knapp on his third WAXEN release, "Weihung Auf Satan". Composer, virtuoso, full time guitar instructor, and songwriter, it seems Toby has a way of filling every moment of his day. This is no surprise for a musician who, at the age of thirteen when inspired by LED ZEPPELIN’s concert film, "The Song Remains the Same", decided he wanted to be a guitarist and took charge of his own destiny through hard work and self-discipline. Toby Knapp is not afraid of exploring many genres of Metal from Neoclassical, Progressive Rock, Black Metal, Death Metal and Traditional Heavy Metal, just to name a few. This maestro of Metal makes any listener question why they did not pick up a guitar as soon as they could hold one and his fluidity leaves you wondering how so much sound can be produced from six strings. 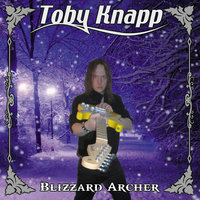 Any instrumental, traditional metal enthusiast will be thrilled to add Knapp's seventh solo release, "Blizzard Archer". "All Hands Planted" is a great introduction, especially for those that may be hearing Toby Knapp for the first time. If you didn't know what this man could do, you will catch on quite quickly. The third track, "13 Astral Gateways", sounds as though Knapp has found himself in an icy tundra, but is certainly prepared for battle as he arms himself with his guitar-sabre and mounts his Tauntaun, slicing and dicing everything in sight. Just stay out of his way and enjoy the show, there is plenty of handiwork to keep you entertained. "Cold Warrior" is traditional Metal guitar at its finest. This track's intro riff somehow reminds me of "God Rest Ye Merry Gentlemen", but that soon dissipates and morphs into a pillar of smoke, certainly ascending from Knapp's guitar, and signaling the sun to rise and join our hero. "Bear 141" is a welcomed track as things keep rolling. It is on this track I realize Knapp's use of a drum machine is not hindering my enjoyment, as it typically would with most solo guitarists. He is a clever composer and no stranger to a studio; this track certainly proves that. "Blizzard Archer" blazes onto the scene and continues as the hero of our story progresses and amps himself up for the final battle. The Yeti begins to rise from her icy lair and "Into the Pavilion" where the Sun breaks through and refracts light from our hero's guitar into the eyes of the monster before him. The vibrations from our hero’s strings fuel the glowing, magic orb in the sky as it continues to tear open the frozen tundra. Shards of ice begin to rain from the celestial thrones of the Metal Gods, burying Yeti beneath the snow she once called home. The Metal Maestro has prevailed. This release assures me of two things; first, we have so much left to hear from Toby Knapp, who seems to have plenty to say and a grand way of doing so and, more so, this musician has been overlooked for far too long. I am guilty of coming into this release rather blindly, but I leave a fan that looks forward to not only exploring his back catalog, but also his many other projects. Toby Knapp should be on every metal lover's radar and if this isn't for you, I recommend you dig into his other works because I am sure there is a side of this multi-faceted musician you will certainly enjoy.